Creative Video Productions Ltd (CVP) is one of the leading Broadcast and Professional video solutions providers in the United Kingdom and Europe. Their client, Foxy Bingo is an online bingo site that was launched in 2005. 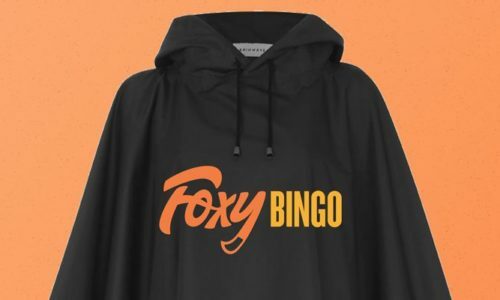 Though we have worked together with the production company and their client, Foxy Bingo on a number of orders, this was the most interesting by far. In the past, we have provided them with embroidered polo shirts, black gilets and transfer printed caps – all of which were ordered for their personalised corporate workwear, to be used in events. They also needed something a little warmer so went for the Regatta Kingsley 3-in-1 Jacket, embroidered with the orange Foxy logo both on the front and the back, so that their staff would be both warm and identifiable amongst the crowd. In their most recent order with Garment Printing they needed 50 black poncho-style printed rain macs for an outdoor event in case of rain. We love trying out our printing techniques on diverse products, so printing on the rain coats was a new challenge we were excited to accept. We opted for the use of screen printing with air-drying inks, and the outcome was excellent. The white ‘foxy’ logo really stood out against the black background. Creative Video Productions Ltd were very happy with the printed rain macs and we look forward to their next order with us!